Universities and colleges require a lot of information to be provided to students, staff and visitors in a timely way. From the practical side of things, these institutions need to inform things such as exam dates and any changes to those dates, mentioning special events held on campus or off campus, broadcasting special lunch options, how to find rooms/lecturers/teachers/staff or even alerting people about emergencies and where to go. In addition, these institutions build a sense of community by helping groups within the university or college to communicate with their members. A few years ago, these institutions would distribute information in a very cumbersome way – via paper. The universities and colleges would set up notice boards and have information displayed which were often overlooked or went missing. Then they tried leveraging technology by sending e-mails, but there were a few issues with these emails, they remained unread or people did not ready access to their email. Things have now changed because of interactive screen technology and digital signage. By combining these two innovative technologies Digital Wayfinding kiosks were introduced. 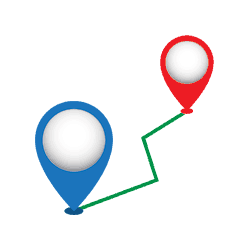 The main utility of a Digital Wayfinding system is to help users find their way around an area. 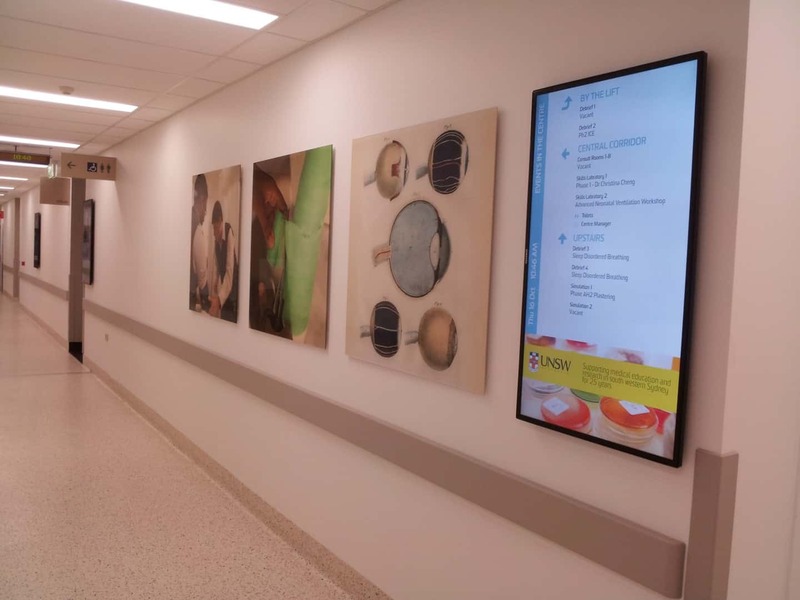 While static maps need to be physically replaced periodically to reflect changes in the campus, a Digital Wayfinding solution can provide changes quickly and easily across all the kiosks in a matter of seconds. 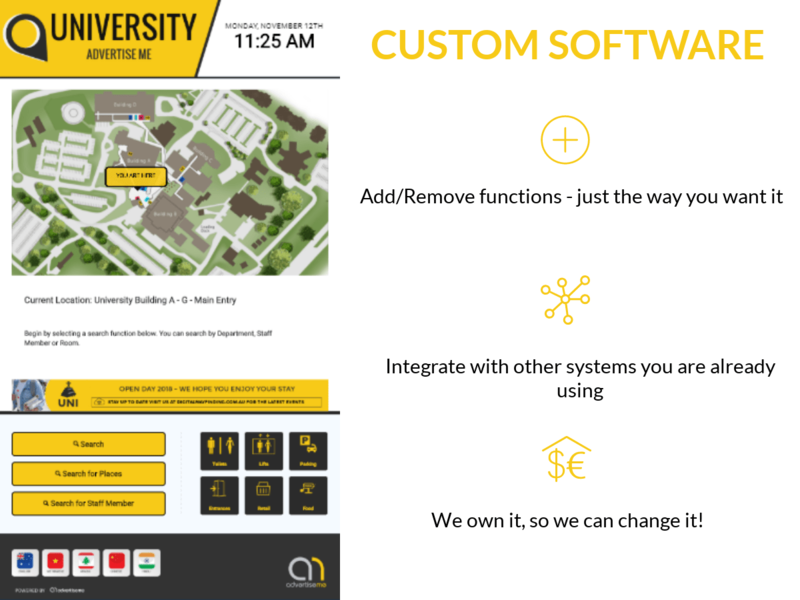 Our Digital Wayfinding solution displays the campus map as part of the screensaver (the screen that prompts users to Touch To Begin) and also on the home screen that displays the overview map. Once a Digital Wayfinder is set up, students will be able to search for where they want to go, where their lecture or class is located, where to find their lecturer and how to get to key locations in the campus. Universities and colleges will also be able to update all this information and the maps remotely, in real-time. The system can even be configured so that it will send directions to the student’s phone, showing the best way to get to their desired location. Digital Wayfinding Kiosks can be spread across different areas of the campus to showcase important information. It can be used to provide location-based information, for example timetables at the gym, upcoming sport events at sporting venues and special events at the conference hall. On the same units, general information can be displayed, such as building closure dates and time, office hours, digital menu boards, advertising, and so on. The best aspect of Digital Wayfindering is that it makes the information available when and where it is needed. The information can also be scheduled and updated remotely making it easy to manage and update. Similar technology to Navigational Based GPS Systems, Google Maps, etc. As you can appreciate, deploying any Digital Wayfinding solution is a complex and intricate process. 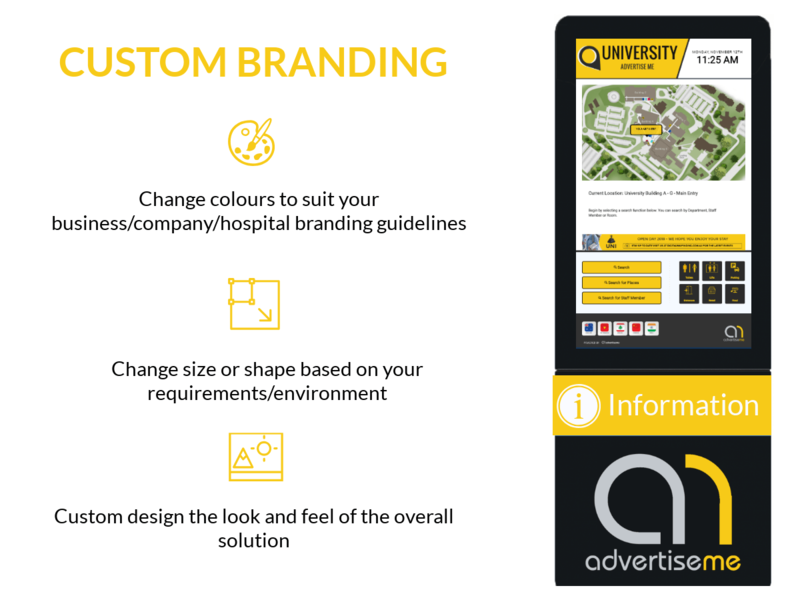 From completing a number of Digital Wayfinding Solutions for hospitals, we have created a simple and efficient process to help you deploy your Digital Wayfinding solution quickly and most importantly – within your budget. We have listed our process below. LOOKING FOR A DIGITAL WAYFINDING SOLUTION?